Reporting should to be actionable, meaningful, understandable, and accurate. Each business and department will have have different key performance indicators, so time has to be taken to develop unique KPIs representative of the business. 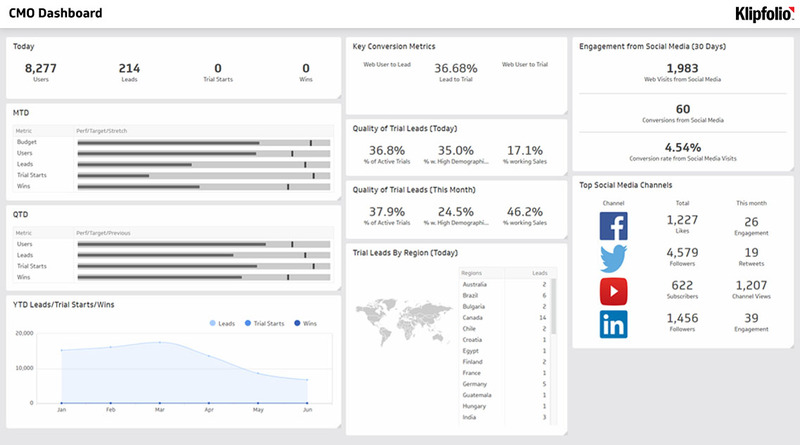 The marketing department will need a dashboard that displays their campaign performances, return on marketing investment, and web traffic performance. Learn more about the best digital marketing KPIs for your business. The sales department will need to track the number of open opportunities, account growth rate, and monthly recurring revenue growth. The executive department will need to monitor top level data from all departments, tracking metrics such as support’s response time, finance’s net monthly burn, user experience’s account retention rate, sales’ monthly recurring revenue, and marketing’s lead to win rate. When building a business intelligence dashboard, it’s important you select the right KPIs for the audience viewing the dashboard. Executives will require a very different set of KPIs than managers or specialists. Displaying irrelevant or unnecessary KPIs can confuse your audience, and result in poor adoption of the dashboard itself. Select different KPIs for different levels of your company. Select KPIs focused on more long-term and medium goals for your executive levels, and more medium to short-term goals for your management levels. Rather than trying to find a few metrics that apply to all levels of the company, select KPIs for each user based on their objectives and the business decisions they’re responsible for. Avoid cookie cutter KPIs. Your company and its goals are unique, and so should be your KPIs. Make sure the KPI is specific enough for you. Is the KPI reliable in predicting business performance? Does the KPI include all relevant information? Does some of the data feeding into the KPI cloud the overall results? Is there something you can actually do to change the projection of this metric? If not, then it’s most likely not the best metric to have. 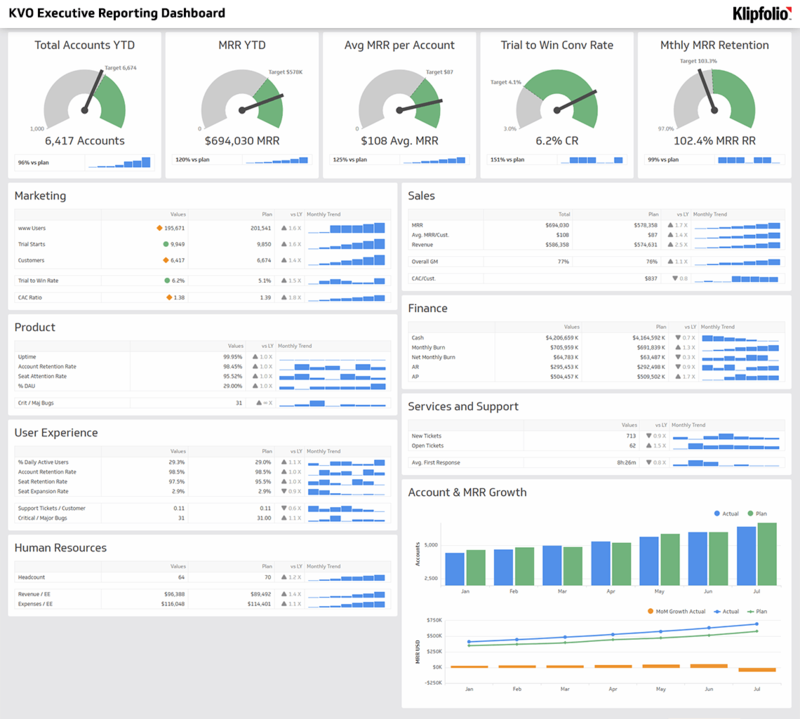 The KPIs on your business intelligence dashboard should be be actionable. Can at least some of the events the KPIs base be controlled by the business? Can the KPI be structured in a way that inspires action? Do these reasons still hold true? Has your business or the context within which it operates changed? Can your KPIs be refined to suit these changes? Are decision makers watching and working to improve them? Do they have the right tools to do so? Is your KPI ecosystem supporting data driven decision making and improving business outcomes? It’s not enough to just have pretty metrics on your dashboard, you need to have a purpose for them. Your metrics need to drive you action and need to give you meaningful results. When adding metrics to your business intelligence dashboard, ask yourself, “why do we care about this?” If there is no main business question that the visualization is answering, don’t clutter your dashboard with it.